A specific style of any Japanese martial art is known as a Ryu, which literally translates to School. Some of the more important early jujitsu Ryu were founded by master-less samurai, commonly known as Ronin. It is interesting to note that while most martial disciplines such as sword fighting, archery, hand to hand combat and the use of some type of spear are familiar to most cultures, the development of styles that are designed to use an opponent’s strength and energy against him is unique to Eastern martial arts. From the middle of the 17th century, the art of jujitsu began to become more systemized and over seven hundred schools would emerge. By this time, they were teaching a combination of throws, wrist locks, grappling moves and strikes using various parts of the body, arms and legs. While elements of the art of jujitsu can be found in Japan’s ancient past, it is widely accepted that the first instant of the martial art being taught in something that closely resembled its modern form was the Takenouchi-Ryu, founded by Takenouchie Hisamori in 1532. When a Chinese priest by the name of Chin Genpin immigrated to the country over a hundred years later, the art developed further with kicks and striking techniques being added to the repertoire of the jujitsu fighter. The Takenouchi-Ryu - The Takenouchi-Ryu is commonly regarded as the first jujitsu school and was founded in 1532 by Takenouchi Nakatsukasa taifu Hisamori. After seeing his master defeated, he retired to a mountain where he trained for six days and nights with his bokken (wooden sword). Legend has it that on the sixth night, he was awoken by a priest who broke his weapon in two, creating the first kogusoku, daggers that the priest taught Takenouchi to use while fighting in close quarters and while grappling. The Sekiguchi-Ryu - The Sekiguchi-Ryu incorporates aspects of jujitsu, kenjutsu (sword fighting), and Iaijutsu (the art of drawing the sword) and was founded by Sekiguchi Yarokuemon Ujimune in around 1640. The Sousuishitsu-Ryu - The Sousuishitsu-Ryu was founded by Fugatami Hannosuke Mansanori in 1650. It stems from the Takenouchi School but incorporates other martial arts such as Iaijutsu. The Kito-Ryu - The Kito-Ryu was founded by Fukuno Schichiroemon in the mid-17th century and emphasised the use of throwing techniques (nage-waza) and the practice of set forms (kata). Fukuno was a former samurai who was one of Chin Genpin’s top students before he opened up his own school. The Jikishin-Ryu - The Jikishin-Ryu, founded by Terada Kanemon, had close ties to the Kito School and the two masters were great friends. The two systems are the oldest known systems of what can clearly be called jujitsu though many more would soon follow. The Kiushin-Ryu - The Kiushin-Ryu was probably an offshoot of the Kito school though the date of its inception is unclear. It was founded by Inugami Nagakatsu though his grandson, Inugami Genpin, is often credited as being the master who made the school successful. The Yoshin-Ryu - The Yoshin System was founded by Yoshin Miura who believed that many illnesses were brought on by improper use of the mind and body. 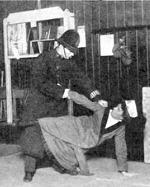 He developed a number of jujitsu training methods that involved arresting devices, which he perfected by studying two of his senior students which led to the development of fifty-one arresting methods. Miura was another student of Chin Genpin who had taught him at the Kokushij Temple after he had become a master-less samurai or a Ronin. The Yoshin-Ryu was further developed by Akiyama Yoshitoki, a physician from Nagasaki (pictured above). After losing many students who felt the style was boring due to its limited number of moves, he retreated to the Tenmangu Shrine for one hundred days. While there, he developed 303 techniques of his own and is said to have developed new ones any time he felt annoyed or unsatisfied with the art. The Tenjin-Shinyo-Ryu - The Tenjin-Shinyo-Ryu was founded by a student of Yoshin Miura called Matayemon Iso. After several years of study, he set out on a form of warrior pilgrimage known as Musha shugyo to challenge the best jujitsu fighters in the country. The fact that he won all his fights gave him the notoriety he needed to open up his own school. 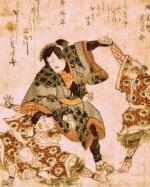 (Techniques from the Tenjin-Shinyo-Ryu are depicted below). Burgin, G. B. [Internet]. 2003. Japanese Fighting: Self-Defence By Sleight Of Body. Electronic Journals of Martial Arts and Sciences. Available from: http://ejmas.com/jcs/jcsart_burgin_1203.htm [Accessed October 31, 2013]. Helm, D. [Internet]. 2010. The rise and fall of Jujitsu before the Imperial ordinance of 1871. The United States Ju-Jitsu Federation. Available from http://www.usjjf.org/articles/jujitsuP1.htm [Accessed October 31, 2013]. Konradsen, K. [Internet]. 2009. The Martial Arts List. Martial Arts of the World. Available from: http://www.maotw.com/list/ma01.html [Accessed October 31, 2013]. Takenouchi Ryu History. [Internet]. 2013. The Official Website of the Takenouchi Ryu. Available from: http://www.takenouchiryu.com/History/ [Accessed October 31, 2013].